I'll never pass up an opportunity to try to convince myself that stuff like cookies and ice cream are healthy foods and good for you in every possible way. It's my mission in life. And these amaranth lemon cookies, these sunny little morsels, could well be the standard bearer in my never-ending quest. I mean, really. Whole grains? Ancient grains too? No overly cultivated, GMO-d, Frankenfood here, no siree. Vegan? Plant-based goodness! Gluten-free? Okay, it may be the food fad du jour for some of us—gluten doesn't bother me, phew!—but it can be an issue. And throw in organic for good measure. Check, check, check, check and check. All good for you, right? So yeah, I'm pretty sure you could eat these for breakfast, lunch, dinner and several snacks, no problemo. But don't quote me on that. This recipe caught my eye for a few reasons. First, the whole graininess because #CreativeCookieExchange is all about whole grains this month. Second, because it's a twofer recipe—you can either make them thick and chewy or thin and crispy with just a couple of ingredient swaps. (I went for the thick and chewy version because A. I didn't have tapioca flour on hand and I'm trying to curb my instinct to run out and buy stuff I'll probably not have much use for) and 2. it's been another week of dental woes and biting into a crispy cookie just isn't in the cards right now.) Third, lemon. I love it in all its forms. When a recipe says lemon, though, it had better deliver LEMON, which these did, albeit in a subtle way. But tell me about this amaranth stuff, you might be thinking. It's an ancient grain, going back more than 6,000 years, is native to Peru and was a major food for the Aztecs. It's a pseudo-cereal, not a true cereal grain, but why pick? It's not (yet) one of those things you can easily find in your local grocery, at least not unless your local grocery stocks a large selection from Bob's Red Mill (luckily, mine does). But it's picking up traction, not only for its taste—think slightly nutty and slightly sweet, at least to my taste—but also for its many health benefits which include, according to the Whole Grains Council (see everything you'd every want to know about amaranth right here), being a protein powerhouse, heart healthy and the aforementioned gluten-free. Good. For. You. In every possible way. And that's what I keep telling myself each time I inhale another cookie. Whole Grains is the theme for this month's #CreativeCookieExchange and these good-for-you amaranth lemon cookies are my contribution. Be sure to check out the links below to see what the other CCE-ers baked up. In a large bowl, stir together the flour, starch (for the crisper cookie), coconut flakes (for the chewier cookie) baking powder, baking soda, and salt. In a medium bowl, combine the flax egg, lemon juice, lemon zest, coconut oil, sugar, vanilla (for the chewier cookie) and water. Scoop the dough onto the cookie sheets using a small cookie scoop. If making the chewier cookies, flatten the dough lightly. Bake for 15 minutes, switching and rotating the baking sheets, if needed, for even baking. When first mixed together, the dough looked a bit soupy to me, and I was afraid I'd have another blobby cookie fail on my hands. But I let it sit for a few minutes and lo and behold, it came together nicely as a very workable dough that was easy to scoop. Okay, I feel kinda guilty using Bob's Red Mill amaranth flour, since this is a recipe from Vitacost, but that's what I had on hand and you know, use what you've got. Forgive me, Vitacost, and here's a link to yours, which I'm sure I would have bought if I'd been out. As I mentioned, you can definitely taste the lemon in these cookies but it's subtle and just a tad overpowered by the addition of the coconut flakes—at least to my taste since I'm not a huge fan of coconut. I do like a lot of lemon so next time I'd probably substitute the 1/4 water for a 1/4 cup of lemon juice, just to boost it up. 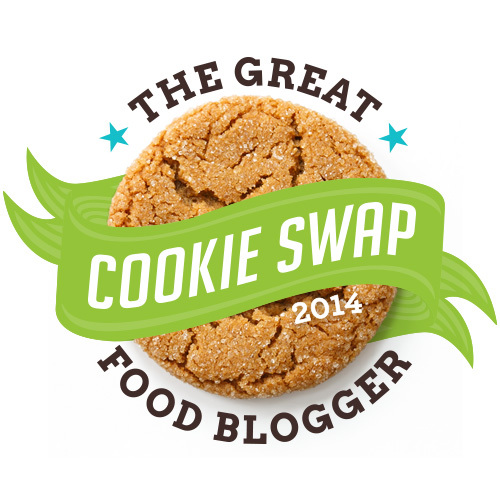 The #CreativeCookieExchange is baking with WHOLE GRAINS in April and we’d love for you to join us! The possibilities begin with whole wheat and oats, but maybe you’ll find a new grain to bake with in your kitchen such as quinoa, amaranth, or buckwheat! One of the things I enjoy most about baking is venturing into different cultures and learning about their histories and traditional foods. And so it goes with this bread, Nángbĭng, a traditional flatbread of the Uyghur (pronounced Wigger, at least according to a video I found online). Who, you may ask, are the Uyghur? Good question! So pay attention, class. There may be a quiz. From Wikipedia (I know, I know. Shut up. The Uyghur American Society backs 'em up. So there. ): The Uyhgur are a Turkic ethnic group, mostly Islamic, living in East and Central Asia, primarily in the Xinjiang Uyghur Autonomous Region in the People's Republic of China, where they are one of 55 officially recognized ethnic minorities. 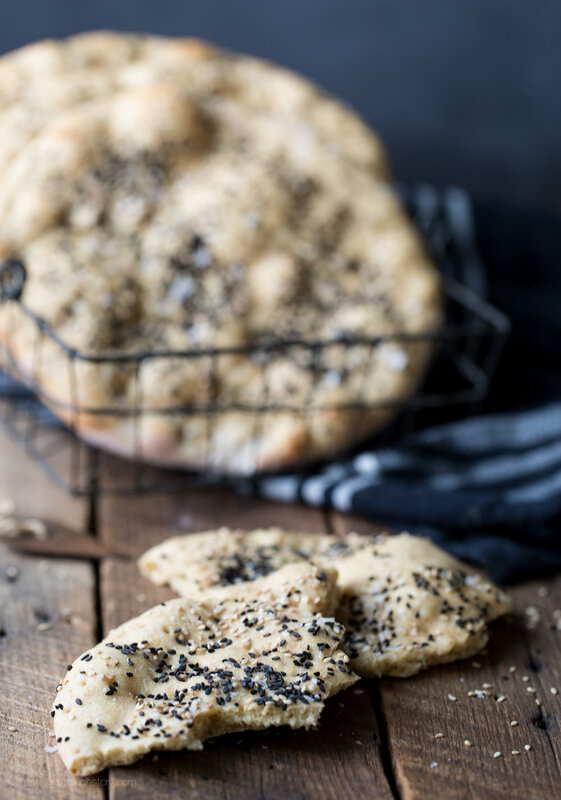 Bread plays an important role in almost all ethnic cultures and for the Uyhgur, that bread is the flatbread they call nang (not sure where the "bing" part of the name comes in but lets roll with it.) According to Saveur, which is where I found this recipe, it's typically rolled out, sprinkled with seeds and spices (or not) and baked in a tandoor. It's also made with a flour that's lower in protein than the typical American all-purpose flour, and it's this lower gluten flour that gives the nang a fluffy texture. Of course, since most of us have access to neither Chinese flour nor to a tandoor (What? I don't have a tandoor?!? Well, not yet anyway…) the recipe is adapted to use a baking stone and a combination of all-purpose and pastry flours. I love flatbreads and this one was no exception. Easy and fun to make, with a great fluffy texture, it's best eaten warm (I slathered mine with hummus—very multi-cultural). It was also a good way for me to ease back into baking, which, frankly, hasn't gone so well for a while. Most of my attempts, in fact, ended up looking a lot like this flatbread only they weren't supposed to. There's a saying the food affects your mood but I can tell you for a fact that mood affects your food too. And my mood until recently has been pretty black, oh, since around November of 2016, if you get my not-so-subtle drift. So it's good to be back (ish). This nángbĭng is my entry for this month's BreadBakers theme: Flatbreads with yeast or starter, hosted by Sonia. Make sure you check out the list below to see what the rest of the crew baked up. They're a super talented and creative bunch. Add the yeast, sugar and 1 1/4 cups lukewarm water to the bowl of a stand mixer and let sit for about 10 minutes or until the yeast is foamy. In a medium bowl stir together the flours, wheat germ and salt, then add to yeast mixture, along with the butter and oil. Fit the mixer with the paddle attachment and mix on low speed until just combined, then switch to the dough hook and kned on medium speed until the dough is smooth, about 6–8 minutes. Cover the bowl, set aside and let rise at room temperature until doubled. Deflate the dough, then cover and let rise again until doubled. While the dough is rising, place a baking stone in the oven and preheat to 500°. After the dough has doubled for the second time, transfer to a floured board and divide it into 4 pieces. Round off the pieces, then cover and let rest for about 15 minutes. Using a rolling pin on a floured board, roll each piece into a 7" round and place on a parchment lined baking sheet. Cover the rounds and let rise for about 30 minutes. Right before baking, prick the rounds all over, then brush with water and sprinkle on any toppings. Slide the rounds onto the baking stone, bake for 3–5 minutes or until the edges are just browned. These breads are best served warm. The original recipe says to add the salt in with the yeast, sugar and water mix but this just about killed me dead. All I could hear in my head was "YOU'LL KILL THE YEAST! YOU'LL KILL THE YEAST! "—a warning that's the bread baking equivalent of "You'll shoot your eye out!" I'm mean, that's a helluva lot of salt, so not wanting to be a yeast killer, I added it in with the flours instead, it worked just fine and I can sleep at night. I only had whole wheat pastry flour on hand and I didn't feel like schlepping out to the store AGAIN so I rolled with it, no prob. I did find the dough to be very sticky though, so I added about another tablespoon of flour during the mix. I baked in two batches, sliding the rounds and the parchment onto the baking stone. About 2 minutes in, I slid them off the parchment directly onto the stone to finish the bake. I use a wide-tooth comb as a docking tool. Works great and it's a lot cheaper than a docker. It's probably the first time I opted for cheap over a gadget. Go me! We take turns hosting each month and choosing the theme/ingredient. Big thanks go to this month's hosts Sonia at Sonlicious and Stacy at Food Lust People Love. This almond flour bread is another entry in the "not half bad" category. Again, as with my pistachio, rose and cardamom shortbread cookies, you might not think this is a ringing endorsement, but this bread is made with almond flour (because I'm sure you couldn't figure that out from the title). Almond flour comes from almonds (you probably couldn't figure that out either.) Almonds being a nut. And as regular, loyal readers (all 12 of you) of this blog know, I hate nuts with the power of a thousand blazing suns. So "not half bad" is actually pretty darned good. At least once a year, I attempt something nutty in the hopes that I'll do a 180 and embrace the nut, because the damned things are everywhere and I'm tired of being a nutty pariah. I generally fail miserably but over the years, I've grown to marginally tolerate pistachios and cashews and sometimes, things of almond origin—excluding extract and the actual nut itself. I still, in fact, loathe the taste and smell of almonds, but for some reason, almond milk and almond flour aren't very almond-y to my palate. I make my own almond milk regularly (the leftover meal goes into the compost) and hello? Macarons? So while I was tempted to bail on this month's #BreadBakers challenge—breads with nut meals and flours—I decided to celebrate my limited acceptance of the nut and forge bravely ahead. 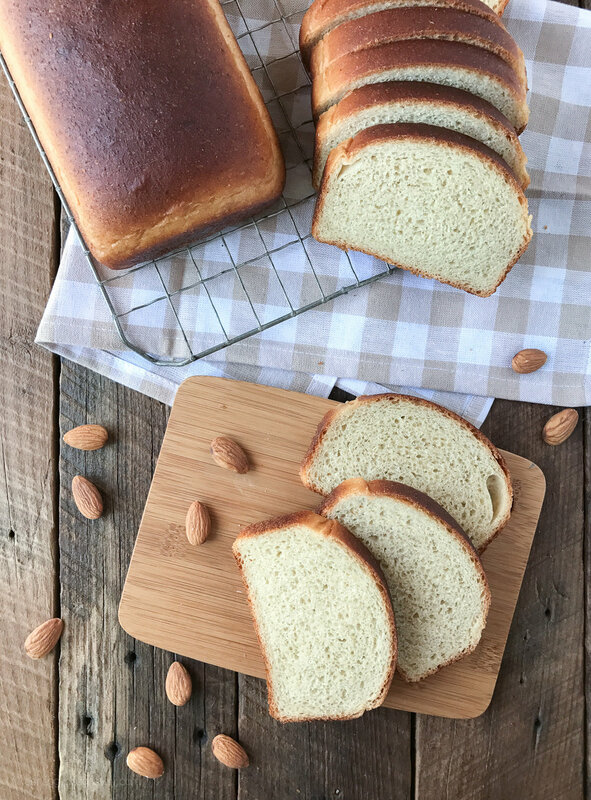 This almond flour bread is right up my alley. There are no nut bits to gross me out and it's a good old yeast bread, which is never a bad thing. It's extremely easy to make—basically dump it all in a bowl, do the typical bread-y thing…VOILA! You got yourself a bread. The taste isn't noticeably almond-y, the bread has a nice chew and the crumb is fine and dense, which makes for great toasting and sandwich loaf. My only issue with it is that I didn't get a particularly good rise, which probably was the result of a little hesitancy on my part. You see, as soon as the weather starts getting hot, so does my un-air conditioned kitchen—my house is basically a giant proof box—so when I baked this up, the thermostat indoors registered 85°F. I always have a period of adjustment when I bake bread in the summer before I get things right, with changes to water temperature or rise times (which I watch nervously), otherwise I end up with an over-proofed loaf. I probably erred too much on the side of caution with this bread, because it's probably a bit under-proofed and I could have let it go a bit longer before baking, hence the less than stellar rise. Live and learn. It's still a darned good loaf, nutty origins or not. 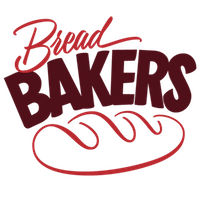 Be sure to check out the links below to see what the other (non-nut averse) BreadBakers baked up this month. And thanks, Cindy, for the challenge! In the bowl of a stand mixer, whisk together the flours, salt, and yeast. Add the water and honey and mix on medium speed until you have a smooth, elastic dough. Transfer the dough to a lightly greased bowl, cover and let rise until doubled. Turn the dough out onto a lightly floured surface, punch it down and divide in two. Shape each half into a loaf and place in greased 8x4 loaf pans. Cover the pans with plastic wrap that's been lightly sprayed with cooking spray (shower caps or Covermate bowl covers are even better and you don't need the spray). Let rise until doubled. Remove the loaves from the pans and cool completely on a wire rack. *If you live in a giant proof box like I do, adjust the water temperature as needed. My water was definitely on the cold side, to slow down the rise. I've tried both Bob's Red Mill and Trader Joe's almond flour and prefer Bob's. It's much finer and bakes up nicely. Trader Joe's isn't bad but if that's all I've got, I generally sift it or run it through the food processor to get rid of the larger bits. 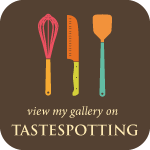 This month's BreadBakers' theme is Breads with Nut Meals and Nut Flours inspired bread, hosted by Cindy at Cindy’s Recipes and Writings. Enjoy all these creative breads using nut meals and nut flours from The Bread Bakers Group!